As I have never flown inside a cockpit, but only played with simulators I find that the dashboard takes most of the field of view(or am I wrong?). So what actually can pilots see given good weather conditions, especially during critical parts of a flight, like take-offs and landings ? I'm generally interested in big airliners. P.S. I am not asking if they could takeoff/land without visual contact. 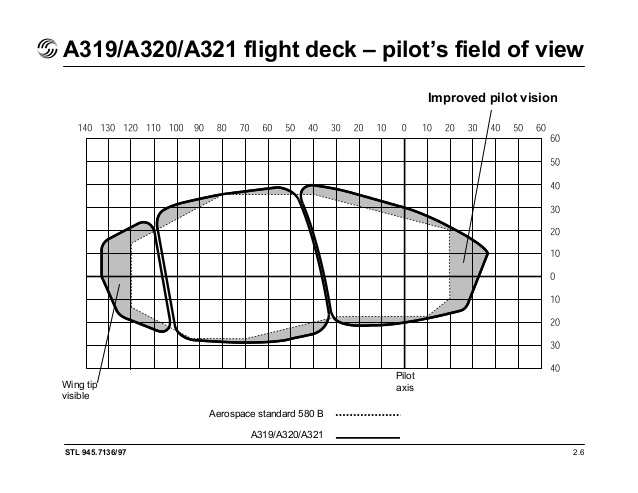 The FAA advisory Circular 25.773-1 Pilot Compartment View design considerations gives certain guidelines for ensuring pilot visibility. 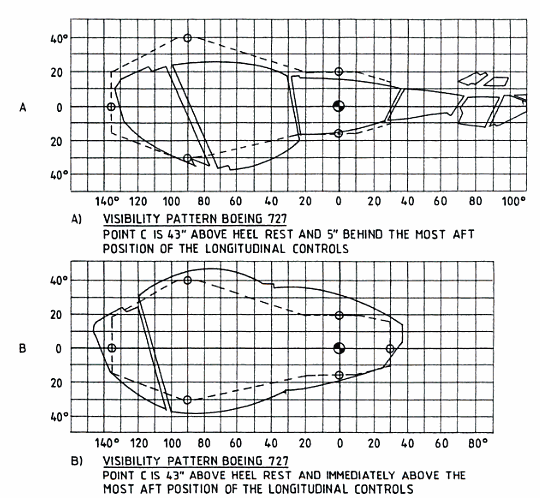 The figure shows a pilot compartment view for optimum collision avoidance when seated in the left (port) seat. For the starboard side, all left/right dimensions are reversed. Usually, the aircrafts offer better visibility compared to the guidelines. 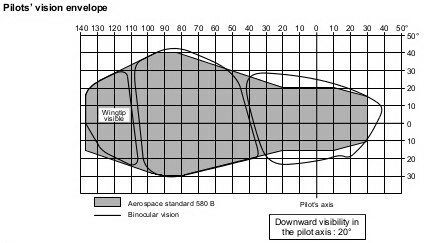 For example, the A330's visibility (from Flight deck and system's briefing) is given here. 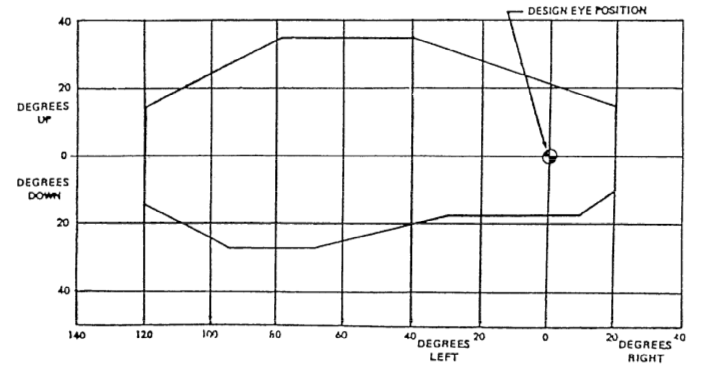 The actual visibility of the pilots will vary according to the seat position For example, the following figure shows the variation in pilot visibility in Boeing 727 when seat position is adjusted. Of course, the pilots can see things which is normally not visible though the windows through cameras mounted on the outside, like on top of vertical tail in A380. This really depends on the type of aircraft and the seating position of the pilot. 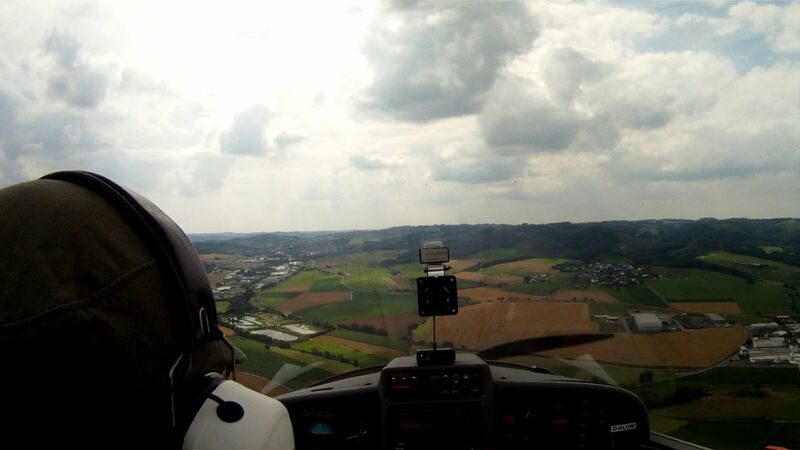 In smaller aircraft, you will have a good view of the area around you, depending on the canopy. In larger aircraft, the instrument panel and cockpit design can restrict your outside view a bit more. Below you will find two pictures taken from the cockpit of a Super Dimona HK36, used for VFR general aviation flights. Both are approximately at eye level. 17 or 20 degrees below horizon is not that bad. It is probably a little less than you see from a typical car, but not by much (of course since the pilots are sitting much higher, the nearest point on pavement is correspondingly further away). Note, that whether the above is actually true depends on how the pilot adjusts their seat. The recommended height for eyes is marked on the post between the forward windows. This might be a stupid answer, but you can see a lot of take-off, landing videos from cockpit in YouTube. Telling distances and relative positions is much easier. For example, you can tell a certain building is 1000 feet away. 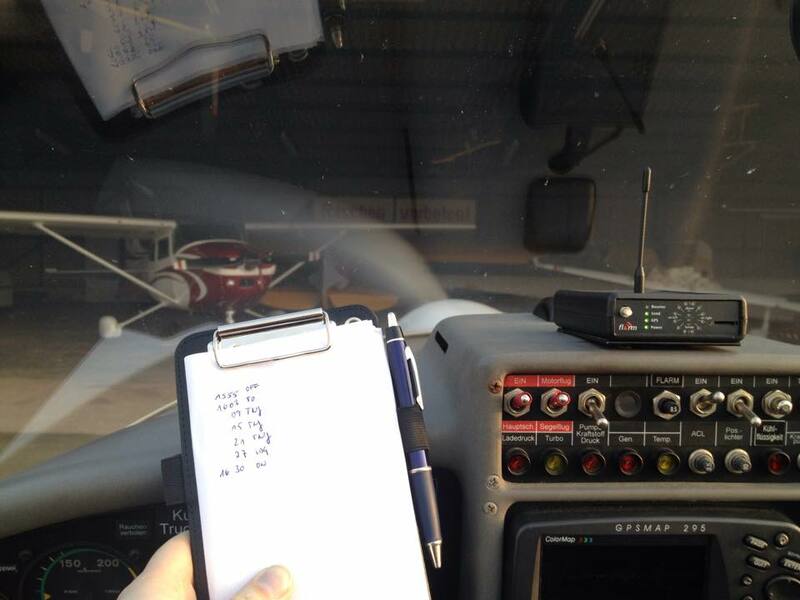 When you are landing, you can take a quick glance to either side of the runway and judge whether it is time to flare. Sitting in the cockpit of a 747 feels rather like standing on top of a 3-story building. The best part is, this building moves! It's truly amazing. I know this sounds obvious, but I have to put it as number two. Even when you are on final, you can see the little cars with people moving around the ramp and terminal. The cockpit glass is just like the windshield in your car; if you can see something directly, you will see it in the cockpit. You will also see the small cracks in the windshield, especially when sunlight is directly shinning at it. This is a natural property of the material used. If you're flying a single-engine propeller plane, your view will be slightly obstructed by the spinning propeller. Spotting other planes in a real cockpit is a bit tricky. If the plane is below you, and you're flying over residential areas with lot of houses, it can be hard to spot. As stated in the comments, the view you get in a PC based flight simulator is not representative of the real thing. To get a decent approximation of what you actually see from an airliner cockpit you'd need at least 6 screens in 2 rows of 3 screens each. Using the virtual cockpit feature of some flight simulator software, and cranking up your viewpoint a bit from the default settings, you can get a much more authentic experience already but it's still limited by the tiny viewport offered by even a larger widescreen computer monitor (let alone a 17" 4:3 display which is what many of them are programmed for as it's the smallest common denominator). Of course that virtual cockpit has its own drawbacks in that the instruments are often a bit blurry and buttons and knobs less responsive than in the 2D view (let alone reality). It's a set of compromises we have to live with as PC flyers, dictated by the limitations of our hardware and budgets. Not the answer you're looking for? 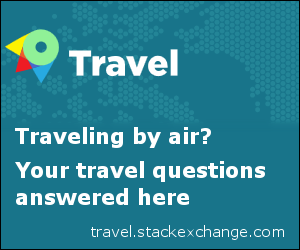 Browse other questions tagged airliner pilots cockpit or ask your own question. Is there still a minimum height required for becoming a Lufthansa pilot? Can I get a photo with the pilots? Why do most helicopter pilots sit on the right? Do windows on the side of the fuselage increase drag? Why doesn't condensation form on the inside of airliner windows? What is the trend of gender distribution among pilots? What do Fighter pilots' thumbs look like? Are any airlines actually flying the Comac ARJ21?